It was a much improved performance from the Green Army that saw them close out the 4-match series in Santiago. The women in green adopted a high press and swarmed the Chilean backline, putting them under constant pressure in the opening quarter and as a result picked up plenty of loose passes on which to form counter attacks. Ireland won the only penalty corner of the half as Deirdre Duke was unceremoniously bundled off the ball while winding up for a shot. Chloe Watkins sweep from the top of the circle was saved and pushed out of a busy circle as her team mates searched for the rebound opportunity. Hannah Matthews and Yvonne O’Byrne showcased their experience as they broke out of their own defensive half to draw markers away before sending crash balls into the circle. The vital touch eluded the Green Army as Duke darted through the centre to find Sarah Torrans on the penalty spot but the ball bobbled awkwardly and was cleared away before she could turn and shoot on the cusp of the half. The pressure continued to mount on the hosts defence as Ireland won several penalty corners. O’Byrne got her side off the mark in the 39thminute as she got low in front of Claudia Schuler to deflect the strike from the top of the circle. Minutes later and Anna O’Flanagan had doubled her sides lead from great play down the right-hand side. Chile’s chance of the half fell to Paula Valdivia as she found herself unmarked on the top of the circle but she couldn’t control the pass and the effort went wide. But the game was put out of sight by Duke following a pacey Irish break in the 53rdminute that left Schuler with no chance. The result means the two teams tie the series with 2 draws and a victory each. Ireland’s women finished their four-game series on a high with three second-half goals earning a 3-0 win, perfectly squaring the week’s matches with one win each, two draws and five goals each. It was a much-improved performance from the Green Army as they adopted a high press and swarmed the Chilean backline, putting them under constant pressure in the opening quarter. Ireland won the only penalty corner of the half as Deirdre Duke was bundled off the ball while winding up for a shot. Chloe Watkins’ sweep from the top of the circle was saved and pushed out of a busy circle as her teammates searched for the rebound opportunity. Hannah Matthews and Yvonne O’Byrne showcased their experience as they broke out of their own defensive half to draw markers away before sending crash balls into the circle. The vital touch eluded the Green Army as Duke darted through the centre to find Sarah Torrans on the penalty spot but the ball bobbled awkwardly and was cleared away before she could turn and shoot. In the second half, the pressure continued to mount on the hosts’ defence as Ireland won several penalty corners. O’Byrne got her side off the mark in the 39th minute as she got low in front of Claudia Schuler to deflect the strike from the top of the circle. Minutes later and Anna O’Flanagan had doubled her side’s lead from great play down the right-hand side. Chile’s chance of the half fell to Paula Valdivia as she found herself unmarked on the top of the circle but she couldn’t control the pass and the effort went wide. But the game was put out of sight by Duke following a pacey Irish break in the 53rd minute that left Schuler with no chance. 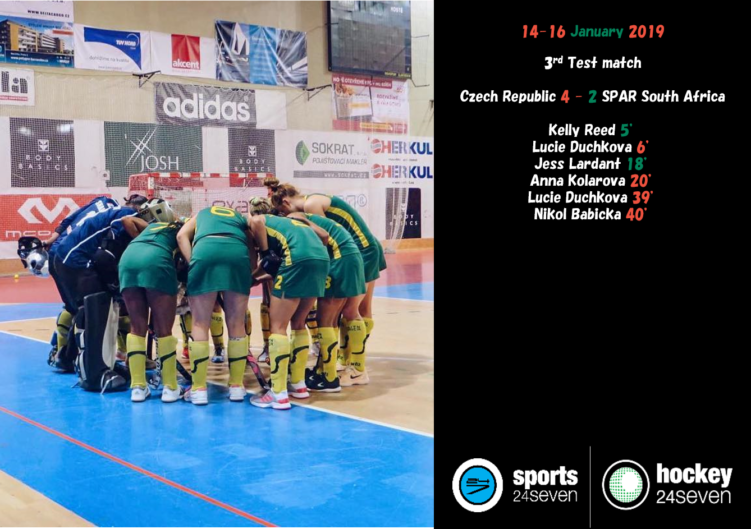 The SPAR South Africa indoor hockey ladies produced a dogged display to win the second test against fifth ranked Czech Republic, before losing the third test to trail 2-1 in the series with one game to go. Having rested after their tormenting travel day the SA ladies looked fantastic in a highly combative win in the morning test. Having led 3-0 at half time through a Tegan Fourie double either side of an Amy Greaves strike. 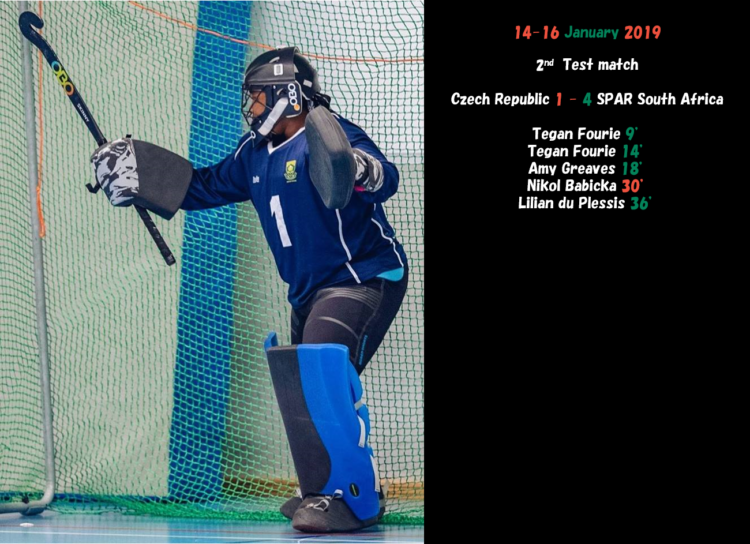 It was as good a half of indoor hockey as the South Africans had played in the European tour so far. The second half saw the hosts spark a comeback through Nikol Babicka, but any sparks were quickly extinguished by the South African defence time and time again. With four minutes remaining Lilian du Plessis settled the game with a good finish to give South Africa a 4-1 win. Although the tour had been historic already, the South Africans managed to raise the bar once again as their victory marked the highest ranked team they have ever beaten. Its testament to the fantastic work done by this team and for this team. The South Africans were unable to follow it up with an afternoon victory facing a controversial few decisions that seemed to check their progress at every opportunity. Having led 1-0 through Kelly Reed and 2-1 through Jess Lardant, South Africa were disappointed to enter the break all square. The second half saw the hosts up the physicality and emerge unscathed from the umpires. To their credit the South African ladies refused to let the umpires derail them but ultimately fell to two late goals to lose the match 4-2. They trail the series with one game to play, with a previously highly unlikely possibility of emerging undefeated from the series. 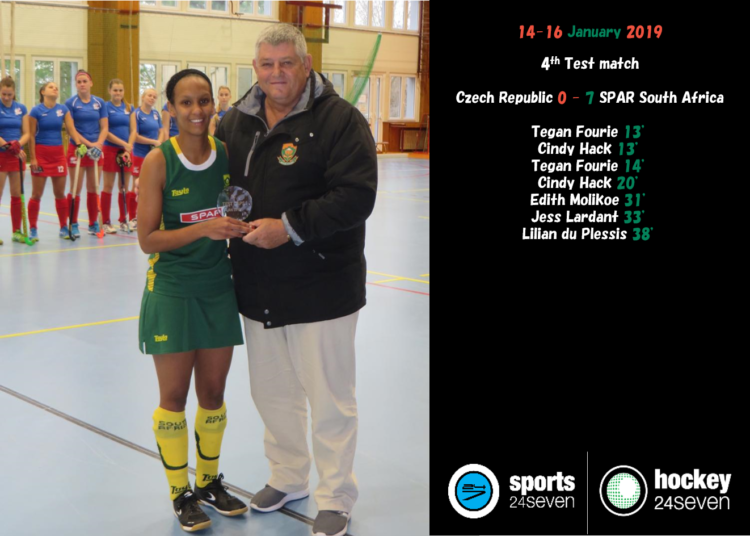 It was a day of celebration for the SPAR South Africa indoor hockey team as their tour to Europe came to a resoundingly successful end. In the fourth test South Africa knew that only a victory would save the series after trailing 2-1 from the opening games. For the 16th ranked nation, it was a massive feather in the cap to be at this point against the 5th ranked team in the world. The fourth test also saw the fourth South African join the 50-cap club. Amy Greaves, from KZN Inland, was presented with a small commemorative trophy from Lennie Botha as she raised her stick on an incredible achievement. It was a moment to be immensely proud of for a superb servant of the game of indoor hockey in South Africa. The celebration from the award appeared to almost distract the South Africans as the Czech’s emerged with vengeance in the opening 8 minutes creating chances and having a lot of possession. The South Africans however stood up to be counted and produced a mesmerising defensive display to keep the scores level. They then produced a Lennie Botha classic as they knocked away three goals in two minutes to take a 3-0 lead. Tegan Fourie netted a stroke before Cindy Hack and then Fourie again made it three. There was time for another display of brilliance as Cindy Hack finished off a brilliant team goal to make it a 4-0 half-time lead. If the hosts expected the South Africans to back off they were sorely surprised as the Africans continued to move the ball around with almost disregard for the opposition and made it 5 through Edith Molikoe, six through Jess Lardant (The only penalty corner goal of the game) and seven through Lilian du Plessis. A final score of 7-0 to the SPAR South African ladies was nothing short of what they deserved. In the past 18 months the team have produced some memorable and historic moments winning the Croatia Cup, winning a record 22-0 against Slovenia, beating the African Champions Namibia 3-0 and of course beating the Swiss 3-1 in Switzerland. All things considered, this result was nothing short of the highlight on a sensational 13 months. We can’t wait to see where they go from here! Giselle Ansley and Alan Forsyth, who both play for Surbiton, have won the prestigious UK hockey player of the year awards for 2018, following the annual poll by the Hockey Writers’ Club. The awards were made on Wednesday at the Club’s annual presentation lunch at the Royal Thames Yacht Club in London. Ansley, the England defender, won the Investec women’s player of the year award for the first time, meaning a member of Team GB’s 2016 Olympic-winning squad has now won the women’s award for the 15th time in 16 years. Forsyth, who like Ansley joined Surbiton in July 2013, claimed the Mercian men’s player of the year to become the first Scottish player to win the award for a decade. The 26-year-old went one better than his runners-up spot at last year’s awards and was voted a standout winner after bagging goals galore for club and country. The Scot has been the leading scorer in the English men’s top flight for the past three years and has already notched 20 goals in the 2018/19 season for high-flying Surbiton. In his sixth season at Sugden Road, Forsyth has accrued an incredible 122 goals. The forward said he was “overwhelmed” to win the award after being voted ahead of four-time winner Barry Middleton and Liam Sanford, the England defender and 2014 Higgins Youth Award winner. In winning the award – and becoming the first Scot to win since goalkeeper Ali McGregor in 2008 – Forsyth hailed his hockey-playing family for supporting the English-based Scot throughout his career to date. He said: “My mum was a forward and scored plenty of goals so I must have her instinct. Both my mum, brother and girlfriend are my biggest supporters and no matter what will encourage me. Ansley, also 26, is rewarded for another stellar year in England’s defence. In the voting, she headed a Surbiton clean sweep in the top three ahead of Hollie Pearne-Webb, last year’s winner, and Hannah Martin to claim the prize. Ansley, top goalscorer in the Investec Women’s Premier Division for the past two seasons, said: “I am incredibly honoured to receive this award from the Hockey Writers’ Club after what has been another brilliant year for our sport in this country. “To play at a home World Cup in front of thousands of fans last summer is something I will never forget and to all those who made that possible I am forever grateful. “Whilst maybe our results as the women’s team this year weren’t exactly as we hoped and dreamed, we have learnt a lot from the experiences gained and we are looking forward to a very busy year in 2019. 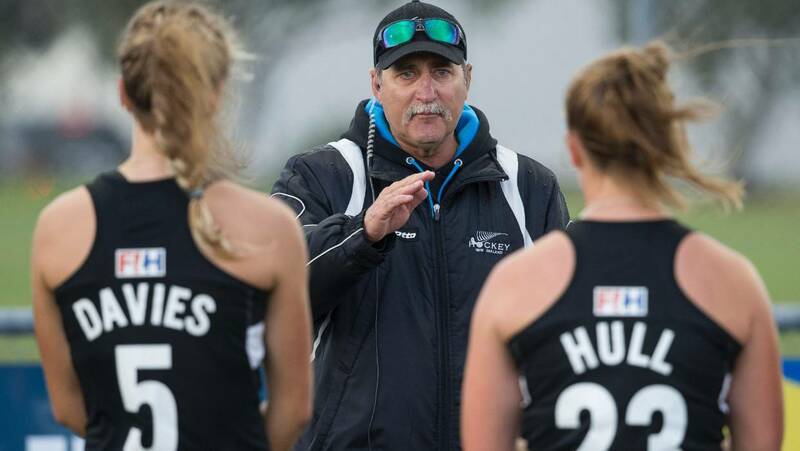 Great Britain Hockey and funding body UK Sport are comfortable with the appointment of controversial Black Sticks coach Mark Hager after a comprehensive vetting process. Hager was last week named to coach the Great Britain and England women's teams. This came after he was subjected to a Hockey New Zealand inquiry into the culture of the team under his guidance, fuelled by a misdirected email he sent out criticising the attitude of some players. Some Black Sticks players said they were afraid to speak up under Hager's command while others praised him. The Times have run an extensive piece on his appointment process under the headline of "Great Britain hired 'bully' coach Mark Hager for women's hockey team" and said he got the job "despite allegations that he presided over a toxic culture while in charge of New Zealand". Questions about Hager's appointment were raised with GB Hockey by UK Sport, which is providing £17.1m (NZ$32.4m) to the women's and men's teams in the lead-up to next year's Tokyo Olympics where Hager is charged with defending a gold medal. But the funding body said it was comfortable with the "thorough" process to recruit Hager despite the controversial end to his successful time with New Zealand. Ed Barney, the performance director of Great Britain and England Hockey, said it was "fully aware" of the Hockey New Zealand review and claimed that the Kiwis had wanted to keep Hager in the job for Tokyo 2020. There were suggestions in New Zealand media that Hager would be sacked as a result of the review but he left to join the British before the findings were revealed. "We have undertaken an extended due diligence process to understand the review's context," Barney told The Times. "We spoke to a number of people close to their programme, and following Mark's resignation we had detailed conversations with Hockey New Zealand, which further reassured our confidence in Mark and his appointment. "Our recruitment process was exceptionally clear on what we are looking for in a head coach, and Mark's profile fits very well with the current needs of the programme. As an organisation we review our performance and team culture after every major tournament. "We are very confident that Mark will make a significant contribution and allow both players and staff to fulfil their potential as we look ahead to the new FIH Pro League and Tokyo." A UK Sport staff member sat on one of the panels during the recruitment process, concerned after a series of scandals over athlete welfare since the Rio 2016 Games, involving 11 Olympic and Paralympic sports. "We did raise questions with GB Hockey prior to the final appointment being made; however, we feel confident all due diligence was thoroughly covered and that the right candidate has been appointed," UK Sport told The Times. Australian Hager took charge of the Black Sticks in 2009 when they were outside the top 10. He guided them to two Olympic fourths, two World League finals, a Champions Trophy bronze, and a medal of every colour at the Commonwealth Games. Strong denial: Harendra Singh has reiterated that the team followed what was decided in the dressing room and meetings, and that no player acted or played an individual game. Ever since news came out of men’s chief coach Harendra Singh being ‘demoted’ to coach of the junior Indian hockey team, there have been allegations and counter-allegations on the decision. A lot is being said about the team’s performance and your own role in the last few months. Your take. Honestly, I am not surprised or angry, I am only disappointed with the way it panned out. Ideally, the federation could have called me during the High Performance Committee meeting, asked me what I had to say and then if they wanted they could have simply said ‘we are not keen on continuing with your services’. On my first day in charge I told the boys, ‘the countdown to my days as coach has begun. Coaches like me will keep coming and going but my only target is to go out with some achievement. Our targets have to be high, we cannot be satisfied with whatever we get and move on.’ I also said that all the 24-25 coaches in the last 20 years were not bad so the players also now have to take the onus and be stakeholders for results and performance. Hockey India has claimed you lack the skills or strategising ability at the highest level and are unable to enforce discipline in the team. This is what has hurt me most. You have put a black spot on my 19 years of coaching and cited my strengths and USP as my drawback! This is also one the reasons I was forced to send a point-by-point rebuttal to the decision. If I accept this statement today then the four people who decided this — people who have either never been a coach or if they did, have not achieved anything — have questioned my very existence as a coach. Discipline, absence of regionalism and groupism, awareness of modern techniques and skills and strategy are areas I am proud of and no one can point a finger at me on these aspects. It is being alleged that Indian coaches cannot handle Indian players and you could not handle the team well. I don’t agree. The entire team followed in all games what was decided in the dressing room and meetings. No player acted or played an individual game. I deny this charge completely. As the chief coach, I am proud they did what was decided. As for last minute errors, that is part of decision-making, not indiscipline and that comes from education. Education is not what we study in text books — it includes socialising, your surroundings and their involvement in decision-making process. I have repeatedly stressed on these. What would you say on the charge that groups were forming in the side? Baseless. Entire Hockey India was present during the World Cup. The media would be present at all training sessions. Did anyone notice anything? I am not always right, maybe I missed it. But people from the HPC were also there — R.P. Singh, B.P. Govinda — if anyone felt this at any point, why did no one point it out? Why did no one say, ‘Harendra, we have to talk about this?’ There can be any number of allegations to justify a decision without proof. KUALA TERENGGANU: Terengganu Ladies Hockey Team (TLHT) coach, Iman Gobinathan did not mince his words when he said that he expects a tough and daunting path ahead for his charges in recording a third consecutive victory when they face the Royal Malaysian Police team – The Blue Warriors at the Batu Buruk Hockey Stadium tomorrow (Thursday) evening. The former Bangladesh team coach sees the clash against the Vivian Mays Soars Cup defending champions as a real test for his team in their mission to wrestle away the title last won two years ago. He said, the presence of ten national players along with other experienced players in the Blue Warriors squad will require their team to be even more focused if they are to emerge victorious. “Playing the Blue Warriors is never an easy task because they are one of the strongest teams around in the Women’s Hockey League this season. “On paper, both teams are evenly matched, however our opposition have a slight advantage because they have vast experience on their side and they have won the league as well. “The team that makes the most mistakes will be the team that will end up disappointed. Therefore, I have instructed my players to keep a very close eye on our opponents, make quick and precise passes and hold out when under pressure and go all out and attack when on the offensive. “Apart from this, I have also focused on penalty corner flicks and the important role that each player has to play because the smallest advantage, if capitalised on, can be the difference between victory and defeat,” Iman pointed out. Last Monday, TLHT ran riot against PSHA-MSSPP (Penang Sports School Council) when they blitzed their opponents 13-0. In an earlier match, TLHT were just as ruthless, as they defeated SSTMI (Tunku Mahkota Ismail Sports School) 5-0. Still active: Former hockey international Jiwa Mohan (right) and New Zealand’s Nicholas Wilson tussling for the ball during the Sultan Azlan Shah Cup hockey tournament in Ipoh in 2011. Jiwa is still playing for the Nur Insafi team of Penang in the MHL. KUALA LUMPUR: Former international Jiwa Mohan is concerned about the decline in quality of the Malaysia Hockey League (MHL) this year. He is also irked by the drastic drop in the number of teams taking part. “The standard of hockey and the number of teams participating in the league have declined in the last few years. “Last year a total of 19 teams competed in the MHL with six teams featuring in the Premier Division and 13 in Division One, which were divided into two groups,” said Jiwa. “But this year it is shocking to see only seven teams featuring in the Premier Division and not even one team registered for Division One this season. “And out of the seven teams featuring in the MHL, Nur Insafi, Universiti Teknologi Mara (UiTM) and TNB-Thunderbolt are just making up the numbers as they can’t match the other four teams like Tenaga Nasional, Terengganu, Universiti Kuala Lumpur and Maybank in the league,” said Jiwa, who made his debut for Melaka Town Council in the MHL in 1999. He added that in 1999, there were more than 20 teams featuring in Division One and Division Two in the league. “In the past we had top clubs like Yayasan Negri Sembilan (YNS), DeTas Yayasan Pahang, Petaling Jaya City Council (MBPJ), MBf, Royal Malay Regiment (RMR), Sapura and KL Hockey Club (KLHC). “They fought hard to win titles but it’s sad to see all these clubs have stopped participating in the MHL. “The quality of the players and game was much higher than what it is today. “Why the sudden decline in the number of teams taking part in the MHL? “What happened to the grassroots development in all states? “Penang have started their grassroots development two years ago and I’m in charge of the development in my home state,” said Jiwa. “Terengganu is the only state that has been actively involved in the MHL for the last few years and they did well to win the league, overall and Tan Sri P. Alagendra Cup titles. “How about other states like Perak, Selangor, Negri Sembilan, Melaka and Johor, who have produced national players? “How are we going to produce quality players for the national team if there’s only a small number of juniors playing in the MHL?,” said Jiwa. “I was only 17 when I played in the MHL in 1999 and I played against men who were far more experienced and skilful,” said Jiwa, who represented Malaysia from 1999 to 2012. “All states and the Malaysian Hockey Confederation (MHC) need to find ways to start encouraging more teams and players to feature in the MHL. “We had 30 teams playing in the Malaysian Junior Hockey League (MJHL) last year but none of these teams have registered to play in the MHL,” said the 38-year-old Jiwa. The 2019 Kenya Hockey Union (KHU) league season will mark the beginning of a new era at Africa’s most successful women’s club Telkom. The 21-time Premier League champions will start their journey without long serving coach Jos Openda, who recently retired ending his flourishing coaching career. This year, Telkom will be seeking to defend both the Africa Cup of Club Championships gong and the women’s league trophy. Seeking to protect Telkom’s legacy, Openda, who also believes that proper planning is key to success, had put measures in place to ensure there is a successor who will take the club to the next level after him. “Retirement was inevitable and that is why I mentored senior players to take over the team. Being a women’s, team it was my wish that the ladies take over and manage the affairs of the club. They have done well and I believe right now, we have four who can perfectly fit in my shoes and lead Telkom to success,” Openda said. Former Kenya number one goalkeeper Josephine Ataro, who has been serving as Openda’s assistant in the last three seasons, is among those primed to succeed Openda. Others are Rose Mbulo, Jackline Atieno and Judith Apiyo, who have also been key to Telkom’s success over the years. “I have no worries because I believe in the abilities of these ladies. They have worked very hard and have walked the journey with the club,” said Openda. “They are not just players but also mentors and role models who younger players look up to and I believe they will protect the legacy of the club,” he said. Openda added that soon, relevant authorities in the club will announce his successor. He said he will not be abandoning Telkom altogether but he will be playing a behind the scene role. The new coach will have her work cut out as she seeks to guide the team locally and internationally. Telkom are eying their 11th continental title this year. Under Openda, Telkom ruled the continent for five years; from 2012 to 2016. They relinquished their crown in 2017 to Ghana Revenue Authority in 2017 but determined to sign off in style, Openda guided Telkom to reclaiming the title in December last year before calling it a day. Lausanne, Switzerland: The International Hockey Federation (FIH) has signed a partnership with hockey fashion and equipment brand Osaka for a duration of four years (2019-2022). With this agreement, Osaka has become an FIH Global Supplier in the category of manufacturers and/or wholesale distributors of hockey sporting apparel and footwear and hockey equipment. Furthermore, Osaka will provide all clothing kits for umpires, technical officials, local judges, ball patrol teams or FIH staff at FIH events. Osaka is a global community of athletes and hockey addicts dedicated to the game. Ambition for the future, high end performance and a young uncomplicated style are descriptions that without any doubt are a big part of the real Osaka DNA and lifestyle. Osaka is bringing hockey heritage to the streets.